by Brink, McDonough & Co.
Tonti Township comprises town three north, two east, and is bounded on the north by Foster, south by Salem, east by Alma, and west by Carrigan township. The Kaskaskia river flows through sec. 6, and also touches sec. 5. The township is heavily timbered in the north, and west part. The Chicago branch of the Illinois Central Railroad enters the township at section 32, and leaves it on sec. 12. Tonti is station on the line situatedon sec. 28. The depot building, stock yards, and the residence of the railroad agent, J. W. JOHNSON, comprise the town. Mr. JOHNSON is now building a grain-house, and buys grain at this point. All Chicago freight shipped to Salem is billed to Tonti, and then hauled to Salem, a distance of four miles. There was a post-office here at one time, but it was discontinued about twelve years ago, after an existence of three years. Mrs. Robert PATTERSON was the post-mistress, the office being kept at the residence of Robert PATTERSON, a farmer near by. The first settler in this township was William PURSLEY. He located on sec. 14, as early as 1820. June 20, 1823, he entered the west half of the north-west quarter of the above section, it being the first land entered in the township. He was an old man when he came here and only lived a short time after he deeded his land. His wife was a Miss Lydia LITTLE before marriage. She was the woman who rescued Thomas HIGGINS from the Indians during the War of 1812. She was a medium-sized woman, was born and raised on the frontier, and had wonderful nerve. It is said that she could handle a rifle with as much dexterity as a ranger. She raised a family of nine children, now all deceased. After the death of her husband she lived in this county many years, and then, with part of her family, removed to Texas, where she died soon afterward. Several of her descendants now live in this county. Britton SMITH, one of the old settlers in this township, says, when he came to Marion county in 1829, there were seven families living in what is now Tonti township, as follows: The widow PURSLEY, William MARSHALL, Thomas ALLMON, John EDDINGTON, Ross JONES, John DAVIDSON and Robert NICHOLS. William MARSHALL was from Tennessee. He settled in the east part of the township about 1823, and afterwards bought the improvements of William NICHOLS, where he resided several years. He was a man of some education, and taught school here as early as 1825. He was for many years a justice of the peace, and was also the fiddler of the neighborhood. It is said of him that often when a marriage was to take place in the neighborhood, he would take his fiddle under his arm, and walk to the place where he was to perform the marriage-ceremony, marry the happy couple, and then play for the merry dancers all night. He was full of mirth and fun, and would always enter into the festivities with as much zeal as any of the younger men. He represented the county in the legislature, and was the first county surveyor. About 1838 he sold out in this settlement, and moved to what is now Carrigan township. He raised a large family, and resided at the latter place until his death. Thomas ALLMON, a native of Tennessee, came to this settlement in 1827, and made an improvement on section fourteen, where he afterwards entered the land five years later. He was a blacksmith by trade, and the first in this part of the county. He was a successful farmer, and left a widow and a large family of children. David ALLMON, his oldest son, entered the fifth tract of land in the township, the sough-west quarter of the south-west quarter section fifteen. Here he built his first cabin, and commenced farming, adding tract after tract until he had quite a large farm, where he lived until his death. His widow still survives him and resides on the old homestead. John EDDINGTON settled on section fifteen in 1828, where he resided until his death. He was one of the prominent farmers here in his time, and one of the early county commissioners. He raised a family of six children, one son and five daughters. Three of the latter yet survive, and are all widows. 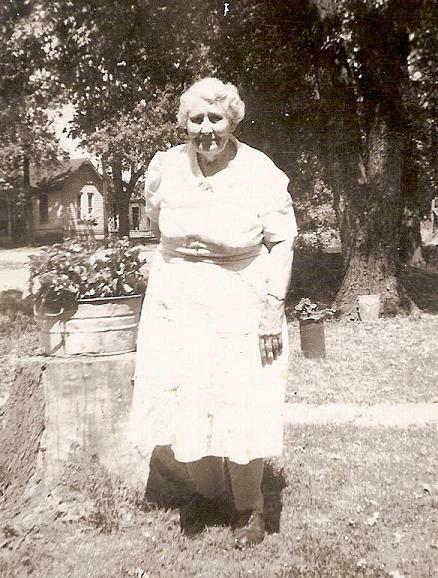 Mrs. Elizabeth HOYT lives on part of the old EDDINGTON homestead. Mrs. Eliza J. FOSTER, and Mrs. Nancy GRAY live in Patoka. Ross JONES from Tennessee settled a place on section thirty-six in 1828, where he lived a few years, and then sold out and moved north of the East Forks, Kaskaskia, on the Vandalia road, in what is now Foster Township. John DAVIDSON settled in the south-west part of the township in 1828, where he lived many years. He afterwards moved to what is now Carrigan township, where he died. Robert NICHOLS, the oldest of fourteen brothers and four sisters, several of whom settled in this county, located in the north-west part of the township, where he improved a farm in 1823, and resided until his death in 1836. William NICHOLS settled in the north-east part of the township in 1823. He owned a slave, and in 1826 moved to Missouri. Wm. MARSHLL bought his improvements. The place afterwards fell into the hands of John S. MARTIN, who lived here for many years. MARTIN was an enterprising and intelligent man, and came here with some considerable means. At one time he owned about two thousand acres of land in this vicinity, and for many years filled the office of Justice of the Peace. He died at Alma in 1865. Abraham SMITH located on section twenty in 1831. He lived near Salem one year prior to this. He died on the Vandalia and Salem road, on section ten, in 1854. He raised a family of five sons and two daughters. Five of the family are yet living. Two were then single men, aged twenty-six and eighteen--the former married and subsequently settled in Foster township, 1832, where he now resides. The latter drove stage, worked by the month, and kept a grocery store at Salem until 1837. He then married, and the same year bought an improvement on section twenty-eight, where he lived until 1840. He then settled on section five, where he still resides. Israel JENNINGS, Jr., whose father was one of the early residents tn the vicinity of Walnut Hill, entered the west half of the north-west quarter of section thirty-one, where he improved a good farm. He was twice married, accumulated a good estate here, and at his death left a large family of children. James BLACK, Jr.,a native of Maryland, from Kentucky here, settled on section seventeen in 1831. In August of the same year he entered eight acres, where his cabin stood; the following year he put up a horse mill, which he continued to run until his death in 1834. He raised a family of ten children, six now living, Mrs. David W. ALLMON, Mrs. Hiram ALLMON, and Mrs. Van T. TURNER are widows; Robert K., Thomas J., and Francis M.; they are now residents of this county, except Thomas J., who lives in Utah. Robert K. BLACK settled the farm where he now lives in 1839; for many years after the death of his father he ran the Black horse mill. He has raised a family of eight sons, all residents of the county. Charles PURCELL, a native of Tennessee, came here in 1832; the following year he settled on section two, where he improved a farm that he afterwards entered, on which he resided until his death in 1846. He raised a family of eight children, five sons and three daughters, six of whom Abraham A., Thomas W., Charles S., and Jemima, now Mrs. William R. CARRIGAN, live in this county, John F., lives in Texas, and William E. is a resident of Springfield, Ill.
J. D. GRAY located on section seventeen about 1840. He filled the office of Justice of the peace for several years, and was a minister of the Methodist church. Lemuel BALLANCE came here in 1836, and entered forty acres in section thirty-three the spring of the same year; he afterwards improved a second place on section seventeen, where he died. General Joshua WOODARD, from Ohio, settled near where his son Charles now lives in the spring of 1840. He subsequently moved back to Ohio, where he died. James R. TALBERT, a native of Virginia, settled in the west part of the township in 1840; he improved a farm and lived here many years; he afterwards moved to Tonti station and improved a place. He raised a family of ten children, five now living. He died November 26, 1874; his widow survives him and lives in Carrigan township. Other early settlers here are James McHANEY, George and Samuel DAVIDSON, Hiram, L. D. and Jackson ALLMON, John SULLENS, John AUGLAND, Edward COLE, Thomas J. BORNING, T. D. WILLIAMSON and Frank PARKER. The first school-house was a log building on section ten; it stood in the heavy timber and quite a distance from any residence. It was built about 1824. William MARSHLL was the first teacher. Other early teachers were William B. HADDEN and R. K. BLACK. The Baptist denomination built the first church on section ten, a log building. It has since been replaced by a neat frame building. L.M. BISEL, elected in 1874; Ander TULLY, elected in 1875, and served four terms; Eli W. BORING, elected 1879, and re-elected in 1880; W. H. BALLANCE, present incumbent, elected in 1881. Located in Section 14 NW, NW. There are 119 burials. Original land owner was William PURSLEY - W 1/2 NW in Section 14 - 80 acres on 20 Jul 1823. Earlies burials: Mahala WRIGHT in 1835; and Russell ALLMON in 1845. Located in Section 21 NW, SE - 1/2 mile from any road, ack in field. The last burial was in 1901. There are 7 BLACKS and 1 SOMERVILLE buried there. 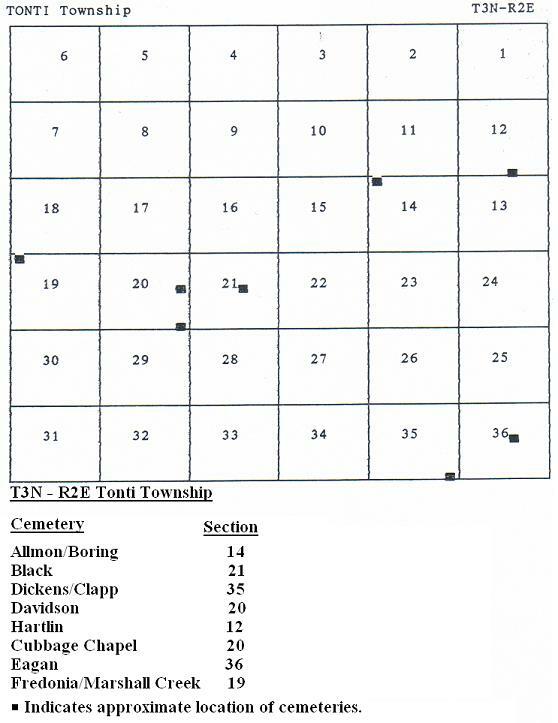 Located in Section 20 SW, SE - 56 burials. In the spring of 1879, a site was selected and William J. DAVIDSON donated an acre of land, the present site of the church. The church was finished and dedicated Jun 1880. The cemetery is just west of the church. Located in Section 20 NE, SE - 3 WILLIAMS. No dates. Located in Section 35 SE, SE - Located on the northwest edge of Salem's City Reservoir. There are 17 burials, 9 of which are DICKENS. Burials from 1855 to 1886. Located in Section 36. There are 85 burials, 15 of which are EAGAN and 16 are LYNCH. H.H. EAGAN was buried there in 1844. An infant Eagan was buried in 1839. Located in Section 19 NW, NW. There are 370 burials. Marshall Creek Baptist Church was organized in 1838. The cemetery is on the east and north of the church. Waranty deed to the ladn was given in 1854 to the Trustee: James CHANCE, Thomas A. NICHOLS, James R. TALBERTS, T. D. WILLIAMSON and John A. NICHOLS. Rebecca STEVENS was buried there in 1843. Located in Section 12 SE, SE. There are 14 burials. Able T. HARTLIN was buried there in 1845. The following, as are the photos, are taken from The Salem Herald-Advocate (Salem, Illinois), "Seven miles nortwest of Salem, near Tonti on the Illinois Central is one of the most complete stock farms in the state. It is owned by H. Lee BORDEN, the millionaire condensed milk man of Chicago, and comprises 941 acres, beautifully located. The entire farm is enclosed with painted plank fence and is subdivided as follows: Thirty acres in orchard, 100 in oats, 300 in timber, and the remainder in pasture, meadows and hay. There are 22 buildings, all clustered near the palatial residence of the proprietor, and comprise two horse barns, two hog barns, cow barn, milk house, poultry yards and coops, slaughter house, storm house, dog kennels, and a large mill house in which is a 10 horsepower engine, the power being used for grinding feed, sawing wood, pumping water, churning, etc. These houses and barns are all built in the best style, have every modern convenience, and the settlement has the appearance, when first approached, of a thriving little country village. "On this farm are bred, raised and marked all kinds of draught and race horses and cattle. There are Normans, Shires, Clydes, Cleveland bays and other trotting and racing horses. Especial pride is taken, however, in the red Polled cattle, which are noted alike for both milk and beef. "Ensign," the red Polled bull was imported and has taken "sweepstake" premium wherever exhibited. He weighs 1900 pounds. One of these cows, "Melton Rose," gave in 12 months 11,568 pounds of milk. "Your correspondent visited this farm while here and found Mr. BORDEN busily engaged in attending a large incubator and evidently taken great pleasure in his work. He is an affable courteous and takes great pride in his farm. He and his wife have just arrived from teh South, where they have been spending the winter, and will remain here until June before departing for their home in Chicago. "This farm is valued at $1,000,000. Farming on such a place as this would lose its terrors even to a newspaper correspondent, and possessing it would gladly lay down the pencil for the plow." Taken from the Centralia Sentinel, Sunday, 6 Feb 1983, "The Borden farm was indeed the pride of the county and on Sunday afternoons many families would drive by to admire the 3-story round barn, with its flag flying from the cupola, the elegant 22 room mansion and the sleek cattle pastured in the lush meadows. BORDEN had spent considerable effort in improving the soil and manure from the Chicago stockyards was shipped to Tonti via railroad to be spread on the land by the hired help. "Another attraction of the farm was the 4-acre deer park, all fenced with 8-foot high woven wire. One of the most admired features was the pa inted wooden fence enclosing the farm. Unfortunately the fence deteriorated rather quickly and a Sentinel article, printed in 1910, notes that "as fast as the fence decays the fenceing is replaced with five-foot woven wire fence, both around and for cross fences." "Lee BORDEN, despite his considerable investment never spent much time at Tonti. Between wintering in the South, yachting at Lake St. Clair in Michigan, fishing and shooting at the various sportsmen's clubs to which he belonged, and perhaps doing some business in Chicago, it is surprising that BORDEN had any time left to spend in Marion County. "H. Lee BORDEN, eldest son of Gail BORDEN, inventor of condensed milk, died last night at Los Angeles, Cal. of angina pectoris. He was 71 years old. For several years he acted as his father's sucessor as president of Borden's Condensed Milk Co. of Elgin, Ill. He leaves a widow and two sons Gerald M. BORDEN of New York and Louis Lambert BORDEN. Mr. BORDEN retired from business several years ago." "The Tribune obituary would seem to refute the oft-repeated story that Lee BORDEN died of salmonella poisoning as a result of eating an improperly refrigerated duck. Nor does the brief Sentinel obituary make mention of the fact. It merely stated: "Mr. H. Lee BORDEN owner of the fine stock farm near Tonti, died Saturday night at Los Angeles, Cal. He was considered a millionaire." "And rightly so was he considered a millionaire; for when the time came to inventory Lee BORDEN's estate, the task kept the appraiser, B. M. SMITH, the cashier of the Salem State Bank, scurrying around the country for days, trying to assess the true value of Lee BORDEN's worth. In his will, dated Dec. 23, 1891, BORDEN left his entire estate to his wife, Theresa, with the provision that, if she preceded him in death, the estate was to be shared equally by her sons Gerald M. BUCKLEY and Bert BUCKLEY. 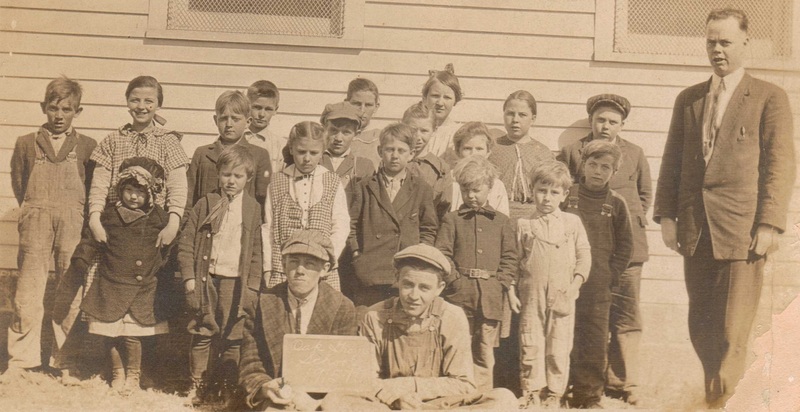 These two boys were Mrs. BORDEN's sons by her previous marriage; and it is obvious from the document that their names had not yet legally been changed to BORDEN. The will was executed at the old Murray Hill Hotel in New York, and the original handwritten copy was filed for probate in the Marion County Courthouse by L. M. KAGY of Salem, who was appointed as attorney for the estate. "Also on file is the complete inventory of BORDEN's possessions which comprises page after page of detailed records, listing each cow by name and including every item within the house and on the farm--right down to the last bale of hay. As might be imagined, Lee BORDEN's assets were considerable. "In his account at the Illinois Trust and Savings Bank was deposited $50,274.77 in cash. His major asset was 15,000 shares in the Borden's Condensed Milk Co. Mr. SMITH had some difficulty in determining the value of the stock and even went to Brewster, N.Y. to interview other shareholders in the company, which was still largely owned by family members. After taking several deposition, a decision was made to appraise the stock at $70 per share for a total value of $1,050,000. "To place an accurate value on the Tonti farm, Mr. SMITH engaged four local businessmen, namely: James D. TELFORD, Frank a BOYNTON, Adam BACHMANN and William J. DAVIDSON. At the time of Borden's death the farm consisted of 788 acres. Surprisingly, or perhaps not so surprisingly, all four appraisers came within a few hundred dollars of each other in their estimates. The entire property, including the residence and all the buildings was appraised by the four men at approximately $42,000. "The household furnishings and all the cattle property were appraised by Thomas RYAN, F. A. BOYNTON and T.W. WILLIAMS, who declared the total value to be worth $5,365. That their estimates were on the conservative side can be gauged from the fact that the contents of Mrs. BORDEN's room, which was elegantly furnished in solid mahogany with ingrain wall-to-wall carpeting, was listed as a total value of $80. "When he was completed with his inventory, SMITH had everything down to the penny--including some shares of worthless mining stocks, and memberships in the Pasadena Gun Club and the Detroit Fishing and Hunting Association which seemed to have no market value at all. When everything was all added up, the value of the estate totaled $1,367,752.01. 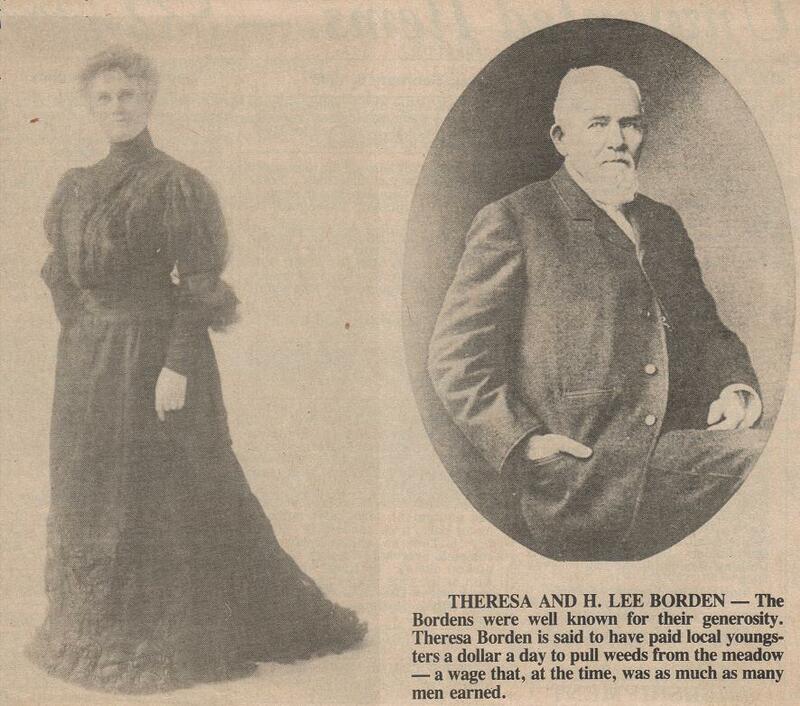 Theresa BORDEN was certainly a rich widow. "With Lee BORDEN dead, less emphasis was placed on the raising of purebred cattle. By 1910, there were only 20 Red Polls remaining on the farm which might now have been better termed the Borden Chicken Ranch. To quote the Sentinel 1910 article: "The farm makes a specialty of raising fine poultry, and has always about one thousand hens laying eggs for the city markets. This large army of hens are of the best stock, including four breeds of White and Brown Leghorns, Black Minordas and Blue Andalusians. The raising of poultry and the marketing of eggs on this large scale can show what the American hen cando when her majesty gets down to business and is cared for by experienced poultrymen who know the business. The sight of a thousand bustling hens does the eyes good, and is worth a trip of many miles to see." "Whether it was the sight of a "thousand bustling hens" or the 22-room mansion with its polar bear rug, grand piano and immense fireplaces, that captured the imagination of everyone in the Tonti area can best be left to the reader's own judgment. It was sort of a house that people dream about. The woolen carpets were so thick and deep "you thought you were walking on feathers." The farm had its own telephone system, power plant, and water tower which was fed by water caught in the huge underground cisterns. And then late one night it all ended. 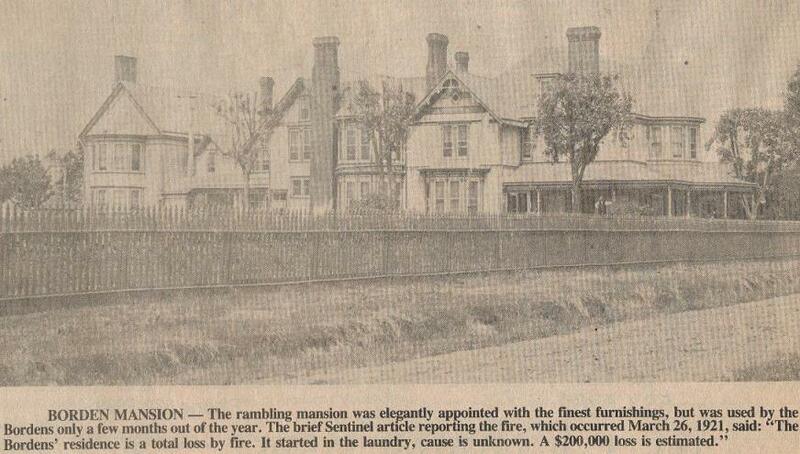 On the night of March 26, 1921, the Borden mansion went up in flames. The Salem Herald Adovacate describe the even in these words in its April 1 issue: "The northern heavens were 'lit up' on last Saturday night from a little after midnight till almost dawn by the reflection of the big frame residence of the Borden farm. "The fire caught in or near the wash house which stood adjacent to the residence on the north side. A strong wind from the south was blowing but in spite of the contrary wind the fire traveled fast against it through the dry white pine timbers of the famous old structure and it was all consumed as were all of the small buildings which served the inhabitants of the dwelling. "None of the barns or office buildings were touched. "L.L. BORDEN, his wife and six children, together with the help, were in the building. The fire was discovered by Mrs. BORDEN who had not yet slept. So fast did the fire make headway most of the occupants escaped with very little clothing. "The BORDEN family have gone to their eastern home where they will remain pending the erection of a commodious bungalow on the site of the burned building." "It was later said that at the time of the fire, some of the help wanted to ge back in the building as they felt there was still adequate time to save some of the contents. This the BORDENS refused to let them do, saying they did not want to risk injury to anyone. And so, virtually nothing was saved. The before mentioned bungalow was never built. L.L. "Bert" BORDEN died in 1926. His mother died the 16th of April, 1927. 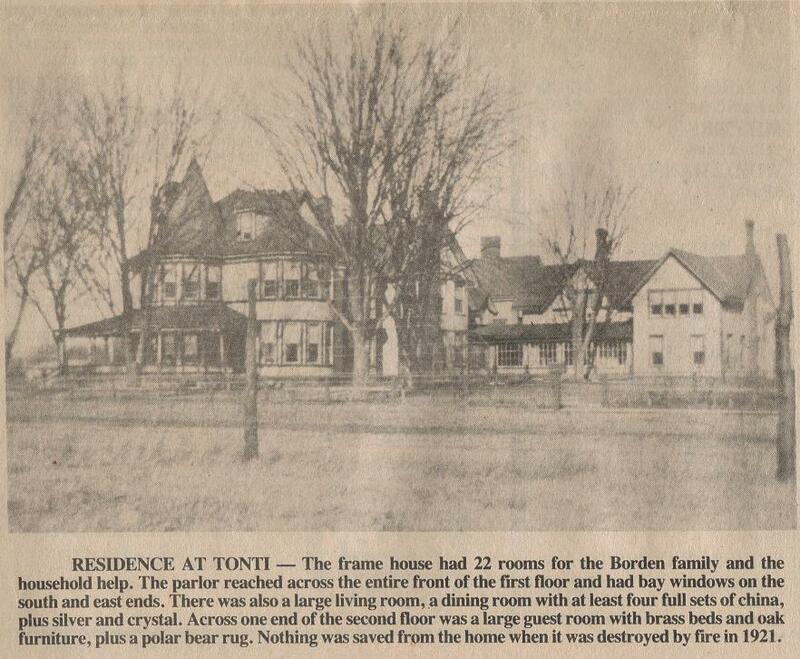 The Borden farm was sold to the ZOLLER brothers, marking an end of the BORDEN's association with Tonti Township. In 1936, most of the remaining buildings were destroyed by a fire. Mr. and Mrs. Warren WILLIAMS purchased the BORDEN farm and at the time the only original remaining buildings were the "Parker" barn and the scale barn. In 1983, the WILLIAMS had been living on the BORDEN farm for about 40 years. The photo at the right is that of John and Meddie (POOL) HINES. Both families being early settlers of Marion County. John was the son of William Hamlin and Carolina (HOWELL) HINES. William was born in North Carolina, the son of Hartwell HINES, both of whom were in Marion County by 1834. 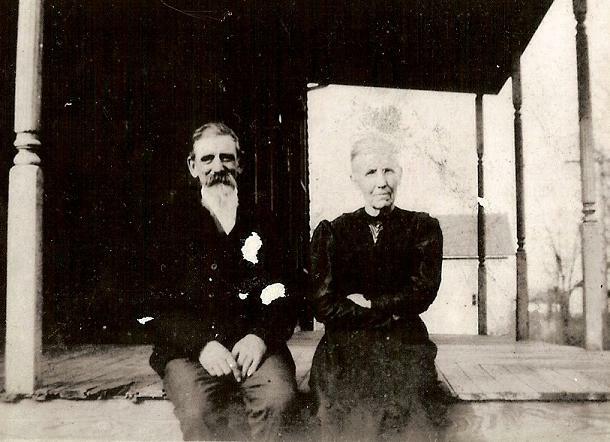 John and Meddie moved to Tonti Township from Alma Township in 1875 and remained there the rest of their lives. They settled in Section 8, which came to be known as Possum Trot. John and Meddie donated land to have the school built. 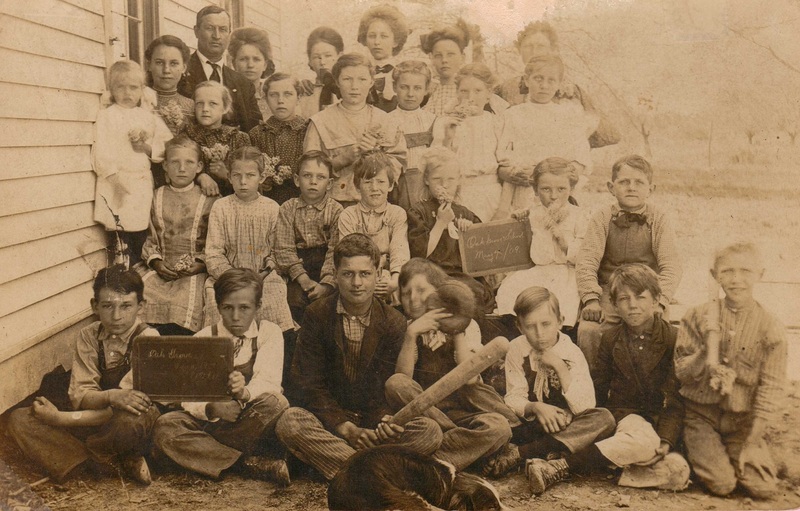 The school was known as both Possum Trot School and McHaney School. 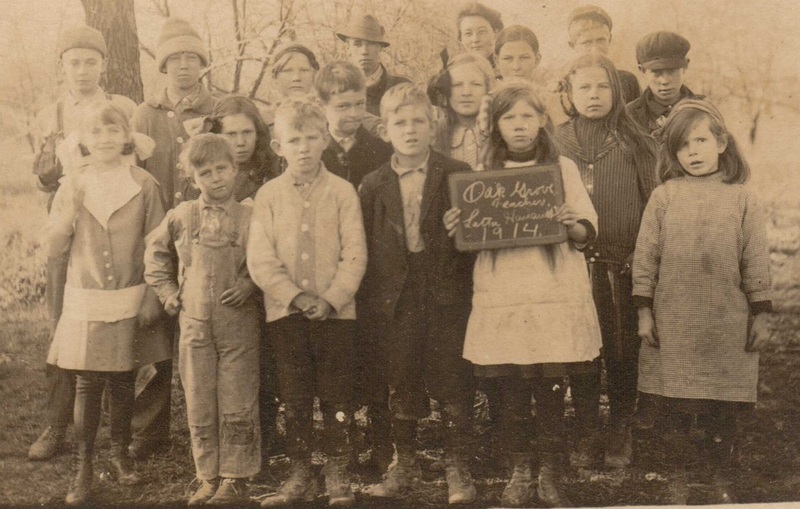 They raised 5 children there: Melvin, who married Nancy Agnes BALLANCE; Mary Florence, who married J. Tom DORRIS; William Henry, who married Nancy Arvilla McHANEY; Caroline who died young; and Nellie Emma who married Thomas PUGH. A photo of William and Hester follows. John and Meddie were buried in the Jones Cemetery, Foster Township, Marion County, Illinois. Where several of the Pool family are buried. Photo below is that of Arvilla (McHANEY) HINES of Tonti Township. She was the wife of William Henry HINES. 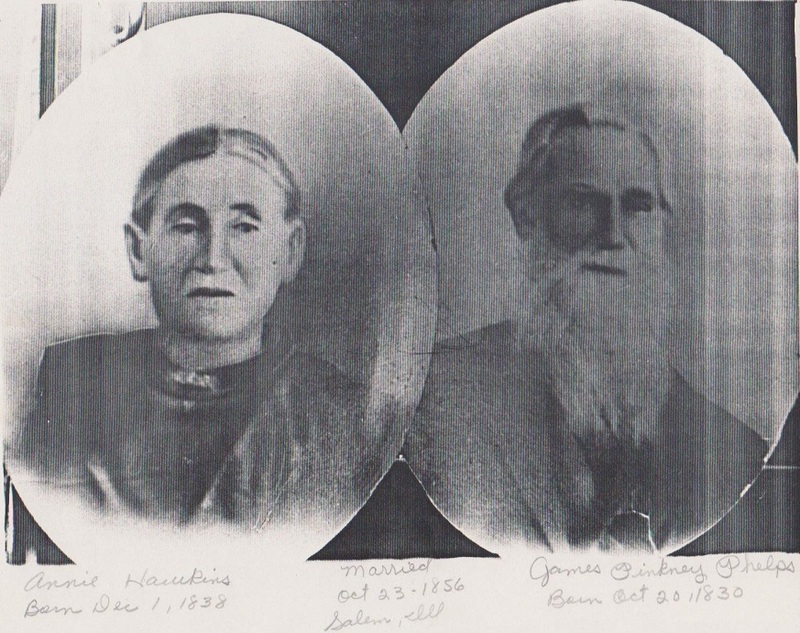 John's brother and wife, William Walker and Hester (GRAY) HINES, photo on the right, were also living in Tonti Township by 1878 and also settling in Section 8. They raised 7 children in Tonti Township. Their children were: Elizabeth C. HINES; Britton Smith HINES; William Harvey HINES; Hattie HINES; Henry W. HINES; Clara HINES; and Effa HINES. 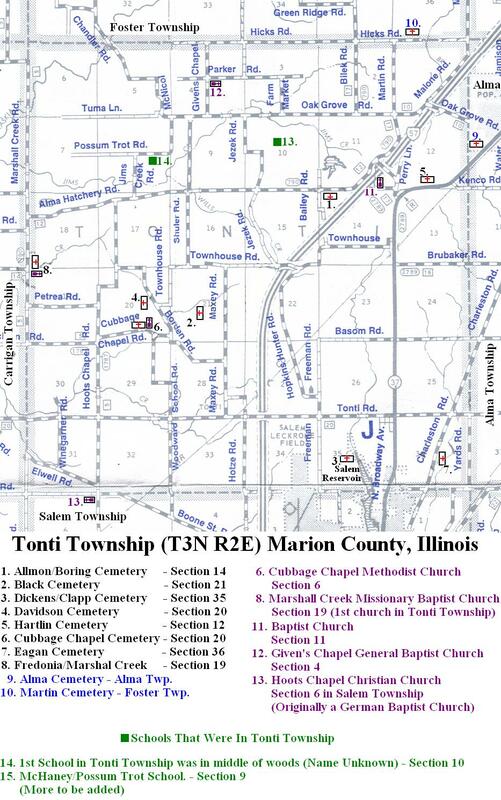 James and Annie had a large family in Tonti Township, as shown by the following two census records. The 1870 census shows James (42) and Annie (31) PHELPS living in Tonti Township, Marion County, Illinois with the following in their household: Mary J. PHELPS age 20; Flora PHELPS age 18; Sarah P. PHELPS age 16; Wm J. PHELPS age 9; Ellen PHELPS age 4; Douglas PHELPS age 7; Ada PHELPS age 5; Ann PHELPS age 4; James PHELPS age 3; and Martha PHELPS age 9 months. Everyone in the household was said to have been born in Illinois. The 1880 census, however, says that Annie was born in Indiana. 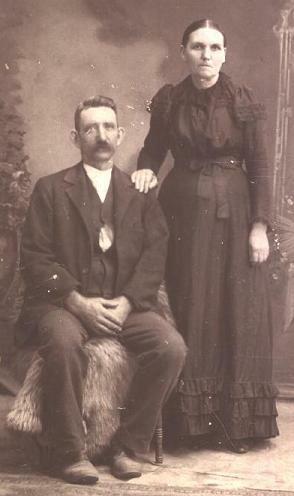 The 1880 census shows James P. (51) and Annie (44) PHELPS living in Tonti Township, Marion County, Illinois. James was said to have been born in Illinois, father in North Carolina and mother in Virginia. Annie was said to have been born in Indiana, father in Tennessee and mother in Indiana. Their children: John F. PHELPS age 24; Nettie A. PHELPS age 14; James H. PHELPS age 12; Mathew PHELPS age 10; Harry PHELPS age 7; Ezza M. PHELPS age 4; Caldonia PHELPS age 11 months; William F. (22) and Martha A. (19) PHELPS; Henry (19) and Rebecca A. (17) OSBERN.